Bobby Hurley is the NCAA’s all-time assist leader and former point guard for Duke that won a national championship in 1991 and 1992. He played for Coach Mike Krzyzewski at Duke University. It looks like Coach Hurley is once again running one of the best shows in college basketball. Arizona State University is ranked fourth in the Associated Press Top 25. They didn’t get one vote in the preseason ranking which is understandable after the Sun Devils have been 30-35 in the last two years. This season the Sun Devils are 12-1, and their only loss was to Arizona which is a conference rival and callous game. The Arizona State University Sun Devils beat Kansas at Allen Fieldhouse which never happens. About the Arizona State University Sun Devils Offense? Coach Hurley has his players playing fast, shooting a lot of threes and averaging 91.8 points per game. They have four wins over teams ranked in the top 50 (Kansas, St. John’s, Xavier, and Kansas State). The Sun Devils are playing a new freewheeling style, turning around their program, and leaning on their coaching influences. They have a new trademark: Guard U. The Arizona State University Sun Devils are spreading out the floor so their guards can drive or shoot it. The offense is making it a tough match-up with traditional teams with bigs. They are playing guys that would be a 3 or 4 anywhere else in the post slot. The Sun Devils are spacing teams out in a unique way where they can get to the rim, make plays or shoot open three’s. What is in the Arizona State University Sun Devils Playbook? 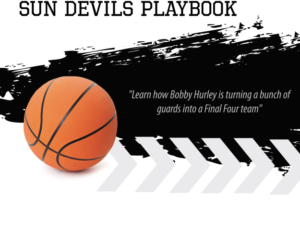 This playbook includes over 55 sets that Coach Hurley ran the last three years at Arizona State University. * Numerous other assorted man plays, press breakers and EOG plays. These set plays will allow your team the ability to spread out your opponent and score in a variety of options for your best players.